Lately, you might have heard about data being migrated to cloud servers in order to cut down IT costs. Have you ever realized about other facets a technology like cloud computing can offer? Well, to some, cloud was merely a technology invented to cut down IT costs irrespective of the fact that it itself has originated from the IT. So, how is it that using cloud model can reduce IT hurdles and fasten up work operations? Well, it actually does so. Cloud, has been acting as one revolutionary force for the IT sector that deals with problems like raising uptime levels instantly, improving scalability, keeping a track of load balance of the cloud server and promoting agile functions etc among others are some of the few characteristics cloud computing offers to the end-users. Built on the three prime verticals including IaaS (Infrastructure-as-a-Service), SaaS (Software-as-a-Service), and PaaS (Platform-as-a-Service), cloud computing gives businesses the choice of expanding their IT infrastructures keeping the above mentioned verticals in mind. They can choose public cloud, private cloud and hybrid cloud model as per their business requirements and get started with working in the cloud environment instantly. Talking about IaaS (Infrastructure-as-a-Service), it is one of the features wherein business entities can get rid of their excess hardware in use to a much refined form, which is switching over to cloud. When we say Infrastructure offered as a service, we probably are laying emphasizing on the fact that users can have the privilege of storing their data, computing or even hardware can be used virtually. Users can simply access their stored data from one big cloud server and share files instantly. Google Docs is a good example in such a case. The current scenario is such that more and more organizations are shifting to PaaS domain of the cloud computing. The reason being, it not just offers advanced platforms to the users to work upon them, but also help them reduce their worries to develop and then maintain them. The open-source phenomenon is a much talked about feature in the cloud domain. This is a platform, which was not much explored lately, but has a bright chance in the the current booming cloud industry. Open-source applications like WordPress, Drupal or even Joomla has attracted several customers use their interfaces via cloud technology. All users do is access these platforms from the cloud server and develop & create applications of all kinds within no time. The third field of the cloud domain is software-as-a-service. This feature gives users the privileg to developing their software applications on the virtual world of computers. No extra investment is required to purchase and install expensive software in the computer systems, and thus, allow users to work freely and conveniently. 2- Raised Scalability Levels: When other things related to IT hardware and storage is looked after by the virtual cloud server, scalability levels rise automatically, resulting in better employee coordination and synchronized work culture. 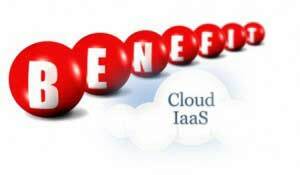 3- Utility Given Utmost Priority: IaaS model is called as the utility model of the cloud computing architecture as it is based upon pay-per-use model. Benefit of pay-per-use means users are asked to spend or pay for only those resources they have used. This is extremely beneficial as not even a single penny is charged extra from the customers availing managed cloud services. 4- Flexibility Counts: When an organization experiences raised scalability and an ultimate uptime, it is because of the flexible cloud environment that is offered to the users. With IaaS services being deployed in the organization, users are enabled to work flexibly without any kind of IT mess. 5- Total Cost of Ownership Becomes Negligible: TCO is reduced becomes it monitors the variable costs including maintenance and management of the cloud server. 6- Keeps IT Environment Free of Chaos, Promotes Green Work Culture: When IT tools and equipments are reduced and a better employee coordination is experienced, it is supposed to be green for the organizations. Trend of using managed cloud services is growing with the increasing demand for it amongst business entities. It has, therefore, become vital for companies to understand their business motives fast so as to create a burden-free work environment for the employees of these companies.